This review has not yet been approved by the owner of this writing service. If you are the webmaster of Writology.com, please Contact Us to approve or remove this review. Writology has pleasant, modern and highly functional design, with all the elements located in places where you expect them to find and containing all the info you need at the moment. If you want, you can delve a little bit deeper and find the details you need as well. Price calculator allows you to very carefully customize the kind of paper you want and immediately see how much it is going to cost. All in all, a pleasant surprise, and very different from the vast majority of websites in this industry. Prices at Writology differ greatly depending on what kind of work you want to buy, how urgent it is and some other factors. What we are particularly interested in, original academic writing, starts at $11.66 per 250 words (the service allows you to change the size of text you need in 50-word increments) if it is needed in 10 days, and rises to $19.99 if it is required in 12 hours. Please note, however, that there are many options that influence the price: type of assignment (essay, thesis, etc. ), type of work (writing, proofreading, etc. ), and many additional categories (web content, business writing, etc.) with their own prices. Customer support is available via live chat and phone. Operators seem to be online most of the time and are eager to answer your questions. Most of the information about the service is provided on the website, so you will most likely use this feature when discussing your order. Officially, there are no samples of writing on the website, but there is a blog written by the company’s employees, and it contains some examples of texts, academic and otherwise. Their quality varies, but is generally on a decent level. You can judge what kind of writing to expect from each particular writer by studying his profile, feedback from customers, titles and descriptions of assignments he worked in the past. 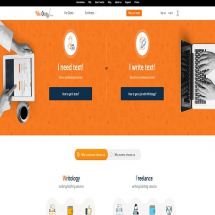 Writology is more of a freelance marketplace than a usual writing service, and it is what makes it better than absolute majority of other services. It adds transparency to the process and looks like a genuinely modern take on things – which is even reflected in the way the website looks and feels.